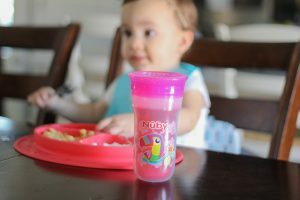 I received the mentioned products from Nuby for an honest review. As always, all thoughts and opinions are 100% my own. As you all know I’ve been guiding Izzy to be as independent as she can be. 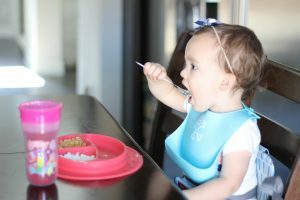 Mealtime is such an important time for her to gain skills socially and physically. 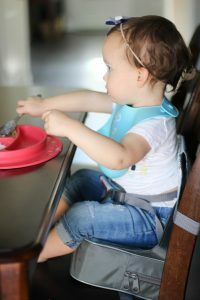 I’m sharing some tips and products that will help you give your child more independance at the table. Izzy hasn’t been in a highchair for a while because I like her up at the table with us. 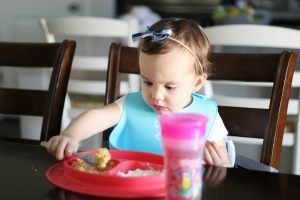 This brings us to #1 on my toddler mealtime independence must have. I love that Izzy sits at the table with us and she can do so anywhere. This booster is perfect for parents on the go or families that like to travel. 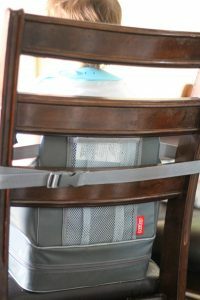 It attaches to the chair when in use and folds up to the size of a soft lunchbox when traveling. I also love how it’s discrete in the home when not in use. Why do I love this mat? Well, for starters it’s a cute face where Izzy can have her food divided up. It also has a super suction to most tables. When I say most, think tablecloth.. no that’s obviously not going to work. Also those metal tables some restaurants have outside with all the holes ..no that kind won’t work either. 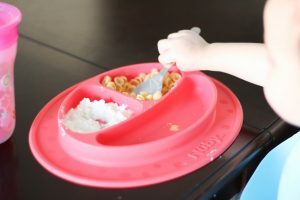 Have fun helping your toddler become more independant at mealtime so you can get your eat on too! Head to Babies R Us for all these goodies except for the booster, find that at Walmart. I love those cups but Evelyn can’t figure out how to drink from them … ugh! I love this! We are all about independence in our house, that booster seat is incredible. That booster seat is awesome! And I NEED one of those cups- I hate cleaning up spills! Yes they are all amazing! These are some great products for sure! We have these cups for the kids too and they love them! 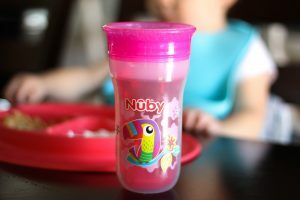 Nuby has the best products! That booster seat is such a great idea. You can’t go wrong with Nuby products!